I’m very excited to announce that late last night (Friday April 25th) I received an email from Nancy at Mid Pen Media’s programming department notifying me that the Cosmic Cafe Show is now listed as one of their “Current Programs”! EDITORIAL: Thanks to Filer’s Files for this article – full article link at bottom of article. Cylinders There are reports of large cylinder-shaped objects all over the world. There are no wings or propellers for lift that indicates some type of propulsion that overcomes gravity. Many cylinder sightings were reported in the 1400-1500s in Germany and France in particular, with the theory that there was a war amongst alien cylinders and orbs. At sunrise on the 14th April 1561, the citizens of Nuremberg beheld “A very frightful spectacle.” The sky appeared to fill with cylindrical objects from which red, black, orange and blue white disks and globes emerged. 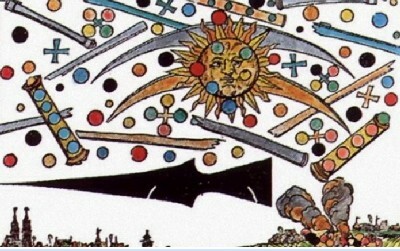 Crosses and tubes resembling cannon barrels also appeared whereupon the objects promptly “began to fight one another.” This event is depicted in a famous 16th century woodcut by Hans Glaser. “Tube” indicates that these objects are hollow or at least have space inside for humanoid beings whereas a “cylinder” could be fairly solid, perhaps the outer casing houses one big… Read More at nationalufocenter.com/2014/04/filers-files-17-2014-cylinder-ufos/ © National UFO Center. Cosmic Cafe Show DVDs are now ready for the Production Team! As promised, I copied the master DVD for you to have a copy. I produced 10 DVD copies, which I believe will be enough for everyone who wishes to have a copy. I will deliver them to Karen Adams at the Mid Peninsula Media Center tonight after 6:00 pm – since I will be there to assist Toastmaster Time TV with their taping. Thanks again to everyone on this team project and also a HUGE thanks to all the Media Center volunteers who also assisted. 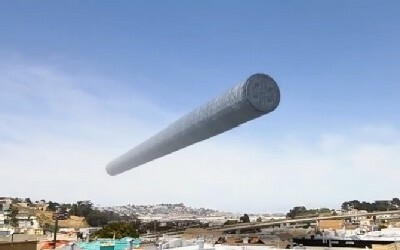 The Border Zone UFO Festivals/Conferences are over there. The space signal said see www.roswellbooks.com/zone/ for the complete list of UFO Festivals and Conferences. Upcoming 2014 Festivals are listed below for your convenience.